Jamshedpur FC overcome Atletico Madrid B's challenge with a 1-0 win! Home / Indian Football / Indian Super League / Jamshedpur FC overcome Atletico Madrid B’s challenge with a 1-0 win! Jamshedpur FC overcome Atletico Madrid B’s challenge with a 1-0 win! Jamshedpur FC registered a 1-0 win over Atletico Madrid B in their final pre-season match in Madrid, Spain. Sergio Cidoncha, the Spanish forward was the architect of this win as he scored the winning goal in the 54th minute. Cesar Ferrando’s men dominated possession from the word go and were creating chances one after the other. Cidoncha and Jerry attempted shots on goal in the first half but their efforts were saved by the Atletico goalkeeper. The eventual goalscorer, Cidoncha also had a glorious chance right at the end of first half but his effort missed the target by inches. Jamshedpur FC went into the break with scores level but were clearly the better side on the night. The Indian Super League side then made four chances at the interval. The breakthrough goal arrived in the 54th minute, courtesy of none other than Sergio Cidoncha. The Spaniard went on a solo run and slotted the ball past the Atletico goalkeeper to give Jamshedpur FC a deserved lead. Another four substitutions followed Cidoncha’s goal. Hero of the last match, Gourav Mukhi made his way into the field. The youngster had a chance to score Jamshedpur FC’s second goal of the night but his shot was saved brilliantly by the Atletico B goalkeeper. Two stunning free-kicks were also taken by Jerry Mawia and Sergio Cidoncha who missed the target by a fine margin. 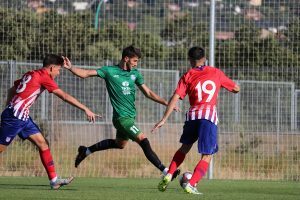 Atletico Madrid B put the pressure on in the last few stages of the game but Raju Gaikwad marshalled the defence well and also put in a last-ditch tackle. With this 1-0 win against a tough opponent, Jamshedpur FC ended their Spanish expedition on a high note. Previous FIFA’s Big 5 Transfer Window Analysis: summer spending by clubs of the Big 5 surpasses USD 4 billion! Next India’s footballing legends to play for a cause in Goa on Saturday!